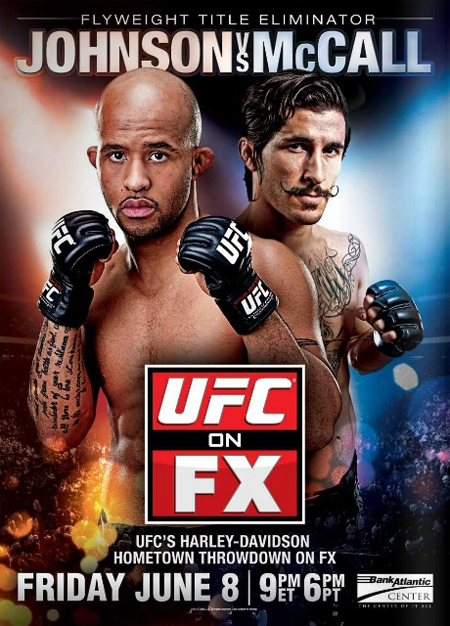 Friday’s “UFC on FX: Johnson vs. McCall II” event caps off a three-week run of Octagon action. The freebie fight card takes place inside BankAtlantic Center in Fort Lauderdale, Florida. A flyweight semifinal tournament rematch between Demetrious Johnson and Ian McCall headlines the festivities. The 125-pounders will battle in a three-round affair, with the possibility of a sudden death stanza should the judges deem their bout a draw after 15 minutes. The UFC’s Facebook page kicks things off by streaming two prelims live at approximately 5:15 PM ET/2:15 PM PT.